The look of a full and sulky lip has been desired by both genders for hundreds, if not thousands of years. They convey a sense of youth that is attractive and pleasing. The desire for luscious lips spares is one that is present in many cultures, both in the past and in the present. Indeed, even across the central steppes of Asia and the vast riches of the Middle East, the lips are regarded as the aesthetic center of the lower face. To many females in particular, they are a major sign for beauty. For many patients today, the lips are a prime aesthetic concern, especially for patients that have severe signs of aging such as a decrease in lip volume, perioral wrinkles, smoker’s lines, and downturned corners. However, many patients share a common negative perception about surgical procedures, including ones aimed at the lips, as the complications of such procedures have often been devastating and/or even permanent. Fortunately, the days of exceptionally poor results from botched cosmetic surgeries are numbered. To help show this, this article aims to provide an overview of popular minimally invasive procedures. Hyaluronic acid (HA) fillers and ablative lasers have become popular treatment modalities over the years, as both are efficacious and have strong respective safety profiles. The best lip augmentation procedures give an ideal duration of action, low risk for side effects, and an optimal natural appearance. For every procedure that will be discussed in this article, they begin with patient selection and analysis. The most crucial process in any treatment should be evaluating the health and medical condition of your patient. Do this to ensure that they do not have any comorbidities that may impede the healing process, or any contraindications that preclude them from a certain treatment modality. Secondly, document the appearance of the lips before a procedure by measuring the lip dimensions and by taking photographs. Next, enquire if they have had any history of lip augmentation prior to this, and if the answer is yes, ask what type of injectable fillers were used. You should always discuss treatment expectations with your patients. When doing so, maintain that the procedure is not meant to be a miracle, and it is sometimes in both of your interests that you cancel the treatment if the patient insists on unrealistic expectations. Carefully examine the severity or degree of structural degradation of the lower face and the volume lost in the lips, as you need information on both matters to know how much filler you will be using. Make sure that patients find the amount of filler you will use to be agreeable with your treatment plan. Patients may find it surprising or odd that your suggestions are against what they have been told or have seen. For example, injecting large amounts of dermal fillers into the lips does not result in an aesthetically pleasing result, even though such an approach may seem intuitive. Explain that the ideal lips also require rebuilding the structural support around the lips. Lastly, reassure them that you will minimize pain during the procedure and that any post-operative complications are mainly transient except in a few severe cases. When you have done all of the above, have your patient sign an informed consent form to adequately document their approval. Hyaluronic acid (HA) fillers revolutionized the dermal filler industry, as they showed excellent results and long duration of actions in soft tissue augmentation. As manufacturers understand more of the cross-linking process and improve on their respective manufacturing techniques, many more modern HA-based fillers are able to last for at least a year. HA dermal fillers offer extraordinary flexibility during their treatment processes: if they are implanted in the wrong place, they can be dissolved with subsequent injections of hyaluronidase. Although there are a huge variety of filler materials available, none of them have a safety profile that approaches HA fillers. Additionally, the lips are dynamic structures that are highly vascular, so using dermal fillers that are not based on HA would unnecessarily jeopardize patient safety. For example, calcium hydroxylapatite-based fillers are more suitable for use in the nasolabial folds and marionette lines because of their elasticity and higher innate viscosity. Furthermore, based on Emer and Sundaram, there is also substantial evidence against its use in dynamic areas, such as the lips and periocular area, as the risk for nodule formation can be exceedingly high in these areas. There is a long-standing argument regarding the use of a needle or a cannula in augmentation procedures. The main point supporting the use of cannulas is that, theoretically, there is a reduced chance of damaging the vessels. However, even small cannulas have the capacity to damage blood vessels, particularly in regions where resistance to the insertion is high. The perioral and the vermilion border wrinkles can be extremely resistant to effacement with the use of blunt cannulas. Furthermore, the use of cannulas may also be costlier for the patient, as they generally require more filler materials to deposit adequately said filler into the deeper plane tissues. 4 Cannulas can be used when patients find it unacceptable to have any bruising or swelling. 25G or 27G cannulas are commonly used and work well with filler materials. For needles, a 30G needle premixed with lidocaine and adrenaline is ideal. Inject at three to four injection areas along the lip and gingival mucosa. The patient feels less pain during the procedure because of the lidocaine, and the risk for inadvertent intravascular injection is reduced as vasoconstriction occurs. Correct the aesthetic defects to best suit the patient’s needs. Approximately inject 1 to 2ml of a dermal filler to the aforementioned area but expect to inject more since many practitioners advocate concurrently treating the nasolabial and marionette defects. When injecting with the needle at the outer area of the vermilion, the filler may fill up one half of the lip from this one point. Minimize these injection points, as they can contribute to bruising. A common order of events is to treat the vermilion border, augment the lips, efface the perioral wrinkles, and then proceed to the mouth angles. A side note: use the linear threading injection technique to treat the philtral columns. Opt for local anesthesia with adrenaline either premixed (preferred) or in a separate injection. If you are confident and skillful of your injection expertise, use a blunt cannula. Stabilize your hands while aspirating before injecting. Gently inject the filler material and do so in small deposits. An early manifestation of intravascular injection is tissue blanching. Pay close attention to your patient’s skin to allow you to react quickly if blanching and, by extension, intravascular injection occur. Have a syringe prepared with hyaluronidase for emergency use. Avoid being overzealous and filling with large amounts of filler material. Consider the entirety of the face when treating the perioral and lip region. HA dermal fillers with fine particle sizes should be used instead of fillers with large particle sizes to maintain the natural characteristics of the lips. Non-ablative lasers are increasingly being phased out as one of the top treatment choices for the lip and perioral regions mainly due to unsatisfactory results compared to other more viable options. Vascular lasers, on the other hand, are more effective in handling vascular lesions. For example, venous lakes that are present in the lips can be treated successfully with long pulsed lasers. 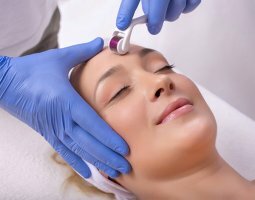 In terms of skin rejuvenation, ablative lasers, erbium, and CO2 lasers are more frequently used for wrinkles, fine lines, and to bring about an overall better skin texture. CO2 lasers have the added advantage of providing tighter skin and can be used on any skin types. Lighter skin types can opt for full ablative laser resurfacing, as that form of treatment is less prone to complications. 8 Full ablative CO2 lasers remove the epidermis and the upper parts of the dermis, which can result in significant pain during the procedure. Therefore, sedation and/or anesthesia is usually needed. The efficacy of full ablative C02 lasers is supported through a prospective study that investigated the difference in outcomes between microdermabrasion and CO2 lasers and found comparative results. 9 CO2 lasers also induce histological changes that may explain its mechanism of action. To this point, new collagen formation begins at six weeks after treatment and then progressively increases at six months and one year after. 10 This pattern in collagen formation signifies the need to treat the face as a whole unit instead of individual areas so as to avoid obvious delineation between treated and untreated areas. These laser machines also come with different presets of energies, pulse duration, spacing, and patterns. Learn and understand their uses, as this is imperative for providing a good outcome. You should also take into effect the hydration levels of the skin and use of local anesthesia, as they are known to alter the function of CO2 lasers. Post-operatively, fully ablative CO2 lasers require high-quality wound caring techniques so as to avoid the development of infections. Reactivation of the herpes virus is a real concern for patients undergoing laser or filler injection treatments. Anti-viral prophylaxis is recommended. For full laser resurfacing, antibiotics, antifungal medications, and antiviral prophylaxis may be required. Keep in mind that adverse effects—such as post inflammatory hyperpigmentation and bacterial, viral, and fungal infections—can occur with laser treatment. Avoid overtreatment, as it can lead to the dreaded scarring complication. Sun exposure should be kept to a minimum, while the use of sunscreens must be advocated to the patient to reduce the risk of pigmentary side effects developing after treatment. Hydroquinone topical treatments may be applied onto hyperpigmented areas, but hypopigmentation is extremely resilient to most available treatment. Both aging and gravity can increase the upper lip length. Therefore, any dermal filler deposited into this area can worsen its appearance. Surgical procedures may be more beneficial, as lip-lifts are known to restore the upper lip with better efficacy. Lip-lifts can also be done under local anesthetics, thus avoiding the complications of having to undergo general anesthesia. 19 Other treatment methods that can be used to treat the lip, such as mesotherapy, carboxytherapy, and platelet rich plasma, vary in their effectiveness. Botulinum toxin can also be used along the borders of the lips and depressor anguli oris to treat dynamic wrinkles around these areas. Most of these treatment methods are ideally used when combined with another treatment modality, as the combination can produce the most optimal outcome. For example, platelet rich plasma has been shown to decrease the downtime related to laser treatments. The lips offer a dramatic and defining attribute to the face. The aging process denies patients of the beautiful volume and structure of the lips. Fortunately, current modalities, as presented here, have their own capabilities to solve this issue. HA fillers are the treatment of choice for the lips, as they are strongly associated with good patient satisfaction and ideal outcomes. Lip rejuvenation and augmentation is a relatively safe and effective treatment, but it requires stringent patient assessment and consultation. Klein AW, Ayers BW. Lip augmentation. (ed). Aesthetic Plastic Surgery. : Elsevier; 2009. pp. 855-860.